Tomorrow - July 10 - is the anniversary of the first ever ARIA chart. As announced by Molly Meldrum on Countdown, it was actually available in record stores on July 4, 1983, but since my posts have always coincided with the dates on the official top 50 printouts, I'm marking the landmark by counting down the full chart over the next two days. We'll start with numbers 50 to 26 today and finish tomorrow with numbers 25 to 1. And why am I revisiting 1983 now, when I've generally gone back in time either 25 or 30 years? Well, I was going to wait until mid-2018 when it will be the ARIA chart's 35th anniversary. But, visitors to the Chart Beats Facebook page often ask me to show more charts from 1983 and 1984, and there's something fitting about going back 33 years to a time when record players were still one of the main ways we listened to the music we bought. Before we get to the top 50, here are the songs that entered this week's top 100 but didn't end up making it on to the printed chart. "Living On The Ceiling" had reached the top 5 back in March, but not even a remix from the album version could turn this fourth single from Happy Families into a hit. This is a surprise. "Total Eclipse Of The Heart", which we'll see in Part 2, was massive, but Bonnie's version of the Creedence Clearwater Revival classic missed the top 50 altogether. One of the American country star's only singles from the '80s not to top Billboard's Hot Country Singles chart was also one of his more successful crossover hits on the mainstream Hot 100. Our first entry on the first ever ARIA chart is also the first ever single from The Style Council. "Speak Like A Child" quickly established that the group, fronted by singer Paul Weller, sounded quite distinct from his previous band, The Jam, who'd reached number 35 in February with their final single, "Beat Surrender". Paul's partner in soul was Mick Talbot, whose last band, The Bureau, had managed one hit in Australia in 1981 with "Only For Sheep". "Speak Like A Child" made a modest impression, but the band would perform significantly better in 1984-5, peaking with top 10 hit "Shout To The Top!". The first of two versions of "Der Kommissar" on this week's top 50, this English-language remake was released by British band After The Fire, who'd broken up by the time it became an international hit. The week's second new entry is from a band I've constantly found myself writing about thanks to their steady stream of singles throughout the '80s and early '90s. Like many of The Angels' releases that I've covered, "Live Lady Live" flew under the radar on the chart - peaking 20(ish) places lower than the other two singles from Watch The Red, "Stand Up" and "Eat City". Seems Forrest (that's his real name) didn't get the memo about disco being over. The music video for this cover of the 1974 single by Hues Corporation features a 19-year-old Sinitta. Featuring members of Goanna, Redgum and Midnight Oil, this charity single protested the damming of Tasmania's Gordon and Franklin rivers. It'd first been performed at a nuclear disarmament concert in February. Debut number three was the latest single from INXS, but it wasn't an ordinary single - and it wasn't actually called "Black And White". The 12" only release was actually named Dance and featured an extended version of "Black And White" as its lead track. Non-album tracks "Long In Tooth" (the B-side to "Don't Change" in North America) and "Any Day But Sunday" (which featured in the film No Small Affair) were included on the flipside. I've always liked the song "Black And White", but despite it being part of a decent-sized hit for the band - especially given its format - it's a track that is often overlooked in INXS's back catalogue. Of course, the fact that their next release topped the chart might have a little something to do with that. The second biggest hit of his career in Australia (up until that point) kicked off a year of consistent singles chart success for David Bowie. His decision to shoot the video for "Let's Dance" locally can't have hurt. It'd been nearly 20 years since The Everly Brothers last visited the Australian top 50, and younger brother Phil returned with this single from his self-titled fifth and final solo album. Along for the ride was Cliff Richard, who'd prove quite partial to a duet in the '80s. Despite Phil and Cliff's chart pedigree, "She Means Nothing To Me" didn't take the chart by storm. Could it have been because the track sounded like it came straight out of the '60s and retro rock'n'roll had gone out of fashion with the demise (for the time being) of Shakin' Stevens in 1982? "She's A Bad Mama Jama (She's Built, She's Stacked)" hadn't taken off in Australia, but we couldn't get enough of Carl Carlton and his sensible slacks on this cover of the Four Tops classic. A seven-week chart-topper back in February/March, this English reworking of the Umberto Tozzi song showed remarkable resilience, spending its 28th week inside the top 50. (I know it says 30 weeks on the printout, but that must be taking into account its two weeks inside the top 100 before it reached the top 50). She'd last featured in the top 50 with 1980's "The Ballad Of Lucy Jordan", and the '60s star added one final hit to her tally with this track from the A Child's Adventure album. Never heard it in my life! Try as I might, I've never really liked this synthpop classic, which features British TV star and "mad" scientist Magnus Pyke on the track and in the accompanying music video. The first of Prince's 12 Australian top 10 hits, "1999" was the lead single from the album of the same name and was successful locally before it reached either the US or UK top 10. Both this single and the album it came from, Scream Of The Real, were the biggest hits by the Sydney pub rock band, who were averaging 200 shows a year at the time. A year-and-a-half later, this British duo would spend 14 weeks in the top 10 with two massive singles. For now, they had to make do with this mid-table placement for their second hit. We saw singer Stan Ridgway's first solo appearance in the ARIA top 100 on last week's 30 Years Ago... post and here is Wall Of Voodoo's biggest hit during his tenure as lead singer. Speaking of solo efforts, here's the debut solo release by Dire Straits frontman Mark Knopfler. "Going Home" was lifted from the soundtrack to Local Hero, which starred Burt Lancaster. In the UK, it became their first number 1 single and in Australia, stand-alone single "Is There Something I Should Know?" was also Duran Duran's best charting song to date. Next up, one of the first local synthpop acts to reach the Australian top 50 did so with their fourth release. Parent album Esteem just missed the albums top 50, however, peaking at number 54. This lead single from the curiously titled Living In Oz album - curious since the General Hospital star was still based in the US - reached the US top 10 and was Rick's final ARIA top 50 hit. It might've taken Geri Halliwell to make this song an ARIA top 10 hit, but you really can't beat the original version of the camp classic, which had been offered to Diana Ross, Cher, Barbra Streisand and Donna Summer first. Number 29 "Wham Rap! (Enjoy What You Do)" by Wham! As it had in the UK, Wham's debut single became a hit in Australia after the success of follow-up "Young Guns (Go For It)". I have a feeling "Wham Rap!..." might also have been only the second song with a rap in it to reach the Australian top 10 following Blondie's "Rapture" - correct me if I'm wrong! This was the peak position for the best charting single by the future Mrs Paul Norton (aka Wendy Stapleton) and her band, which would add Paul to its line-up in 1984. Things I've learnt writing this post: Michael Been, the singer of The Call, is the father of Black Rebel Motorcycle Club frontman Robert Been (aka Robert Turner). This week in 1983, Michael and his band had the highest new entry on the first ARIA chart with the politically charged "The Walls Came Down". It didn't get much further and was the band's only top 50 appearance, but no doubt anyone who can remember 1983 will know the song's memorable hook and can join in on the "ya, ya, ya, ya, ya, ya, ya" bit. Just around the corner for us in Part 2: the first ARIA top 25, including the other version of "Der Kommissar", two hits by both Eurythmics and Michael Jackson, The Police's stalker classic, the most successful 12" single of all time and the song that'd end up as the year's biggest single. I'll also explain how this first ARIA top 50 fits in with chart history pre-1983 -and, yes, I'll show you the actual chart printout. Hard to believe this was virtually a third of a century ago now; that makes me feel old. I like the Blancmange track (which I hadn't heard before), and prefer it to 'Living On the Ceiling'. I prefer the Falco version of 'Der Kommissar'. It seems silly having a song in English with some random German lyrics at the end of the chorus and a German title. Didn't think I knew 'Black and White', but I do. Yes, it seems forgotten/overlooked. 'Let's Dance' is one of the songs I most associate with 1983. Never heard the Carl Carlton track. Nice pants, as you say. The two extra weeks for 'Gloria's TI (times in?) tally might be because it entered the top 50 on the first chart of 1983, which presumably was 'for the 3 weeks ending', taking into account the Xmas break. It seems obvious now, but I had no idea that instrumental track was by Mark Knopfler, or what it was called, until now. I probably haven't heard or thought about that song since the 80's, but liked it at the time. I assume the Weather Girls took their name from 'It's Raining Men', but I suppose it could just be a freaky coincidence. Blondie's 'Rapture', if Debbie's 'rap' counts, would have (presumably) been the first song featuring a rap to hit the Australian top 10. I thought I'd checked Rapture, but you're right. I must have only checked things like White Lines, The Message, The Breaks and Rappers Delight, none of which made the top 10. Re Gloria - those three weeks are accounted for in the 28. The 29th and 30th weeks have to be its weeks spent at numbers 100 and 51 on the way into the top 50. Bonnie Tyler's tally of 10 weeks also includes a week at number 67, so I think this first chart includes weeks in the top 100 and then as new songs came into the top 50, it eventually became weeks in the top 50. I just discovered this terrific blog. It covers one of my long-time hobbies - Top 50 chart music. Until seeing Chart Beats, I did not know that the chart had been initiated in July 1983. 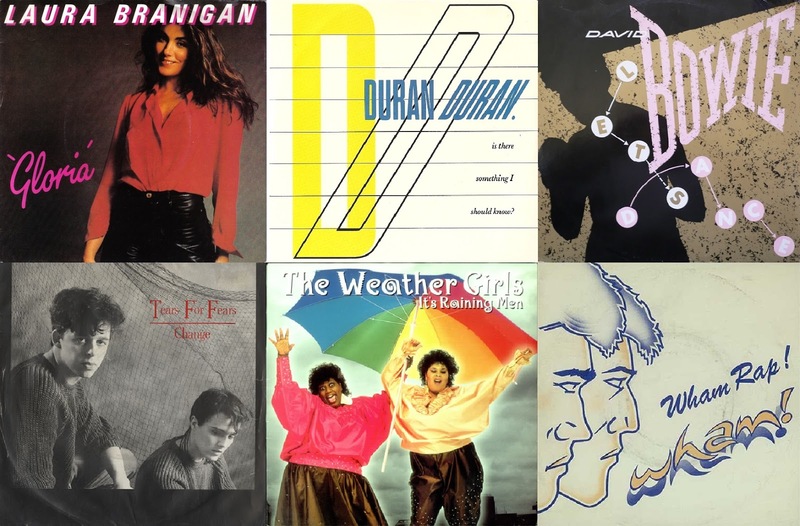 I first discovered printed Top 50 charts about a year later in 1984, and being a keen statistics hound, I initially became interested in them for the chart positions, then later got into the songs! For this week, the pick of the new entries is Going Home, by Mark Knopfler - a guitar instrumental tune I've always loved since hearing it on the radio at this time in mid-83. It was the first time I had ever heard of Knopfler/Dire Straits.